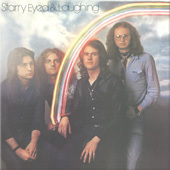 'Starry Eyed & Laughing' was released to universal praise, garnering good reviews in national and local press far and wide, getting heard thanks to the enthusiastic efforts of charismatic CBS Press Officer John Tobler (who coincidentally attended the same school in Bedford as McGeeney and Poole, albeit a few years earlier). 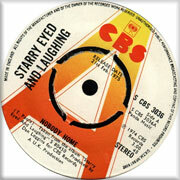 With no daytime radio play on the UK's only national station - BBC (the only way to get a hit at that time), 'Money Is No Friend Of Mine' didn't chart. Even so, relentless gigging (with more great live reviews), local radio sessions and interviews, and further sessions on John Peel's BBC evening show meant that LP sales were respectable enough for CBS to option a second album. In February 1975, the band's gigging schedule included a memorable concert supporting Country Gazette at the Victoria Palace Theatre, and a second single from the first LP - 'Nobody Home' - was released, and voted a 'People's Choice' on London's Capital Radio, though this record too was ignored by the BBC's daytime playlist czars. 'Nobody Home' had been remixed at Redan Studios, West London with Bill Aitken (who'd worked on their first John Peel session) at the desk, and he was booked to engineer the next album to be recorded at Rockfield Studios in South Wales. Taking their first break from 17 months of touring, rehearsals for the album began in March, with recording scheduled for the last 2 weeks of April.